DETROIT -- Launched as a 2008 model, the Dodge Journey crossover got lost during Chrysler's struggle to survive. Now Chrysler Group is under new management, and the Journey is getting what amounts to a relaunch for the 2011 model year. The company today released the first photos of the vehicle, which will arrive in dealerships this year -- probably December. The Journey remains essentially unchanged on the exterior. But the interior has undergone what Chrysler calls a “major overhaul,” including the debut of a couple of new electrical systems. Under the hood, the 2011 Journey gets a new engine -- Chrysler's 3.6-liter, 283-hp Pentastar V-6, which replaces the 3.5-liter V-6. Kathy Graham, a Chrysler spokeswoman, said the new engine will crank out 20 hp extra with no penalty in fuel economy. The Journey also rides on a redesigned, retuned suspension. Inside, the Journey gets Chrysler's PowerNet electrical architecture, a new system that powers the vehicle's electronic communication systems. PowerNet allows Chrysler to offer new technologies as they're developed, said Graham. 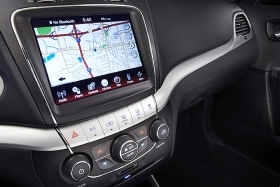 The Journey also will be offered with Chrysler's UConnect Touch, a new touch-screen command center that includes a Garmin navigation screen and voice recognition. All this is housed in a new one-piece instrument panel, with redesigned heating and cooling vents and a new multifunction, three-spoke steering wheel. There is also a new center stack. The Journey is manufactured at Chrysler's Toluca assembly plant in Mexico.